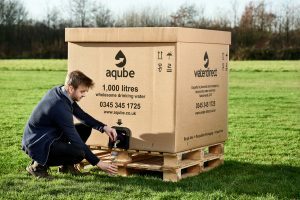 The unique 1,000 litre Aqube™ is a convenient, economical and recyclable drinking water supply ideally suited to sites and events that require a one-off delivery of quality assured wholesome drinking water. The wooden pallet base, cardboard packaging and plastic liner are all fully recyclable; after the water inside has been used, simply break down the container and recycle locally. Delivered anywhere in mainland UK at a fixed competitive price and available with a range of couplings and attachments including a foot pump and hose, each unit comes complete with a versatile tap kit suitable for push-on or ‘hozelock’ fittings included as standard. The Aqube™ can be much more economical than a water bowser or static tank hire for short term requirements as the two way road transport and installation costs associated with rental solutions are not incurred. Delivery is made via third party pallet network and is possible only to an appropriately accessible hard standing area. Aqube™ is not suitable for delivery to grass, gravel or unmade road and customers wishing to redeploy their Aqube™ on site will require their own lifting or moving equipment. The vehicle is not able to deliver to gravel, grass or unstable ground. Drivers are not able to assist beyond the initial delivery. Customers are responsible for relocating on site following delivery, and recycling or disposal of the product after use. Water is quality assured to the point of delivery.